Working in an occupied site is always a challenge, particularly when the project needs to be delivered quickly. InSite not only met this challenge, but delivered Ausdrill’s Head Office refurbishment on time, within budget and ensured the client’s daily operations were unaffected. 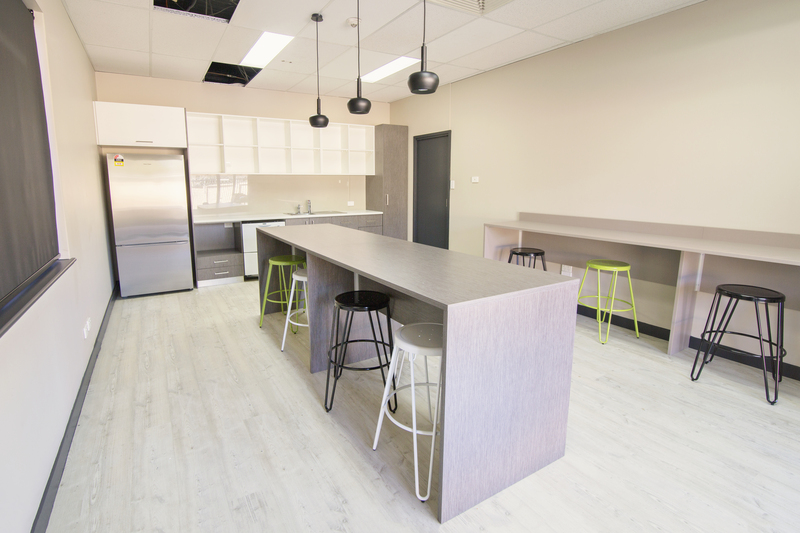 Ausdrill identified several areas of the office which required renovations; each requiring careful design and on-site coordination to ensure the project remained on track and was delivered resourcefully. Several parts of the open plan were modified to provide a more efficient layout which caters for additional staff. Bench style desks with yellow and grey screens were installed throughout the workspace with several collaborative zones which serve as alternative meeting areas. In addition to new offices, existing offices have been modified and redesigned using angled walls which in turn provides supplementary storage space. This new format also provides a contemporary aesthetic to the space. The breakout area was converted to a larger space which caters for an increase in staff and serves as a multipurpose space. 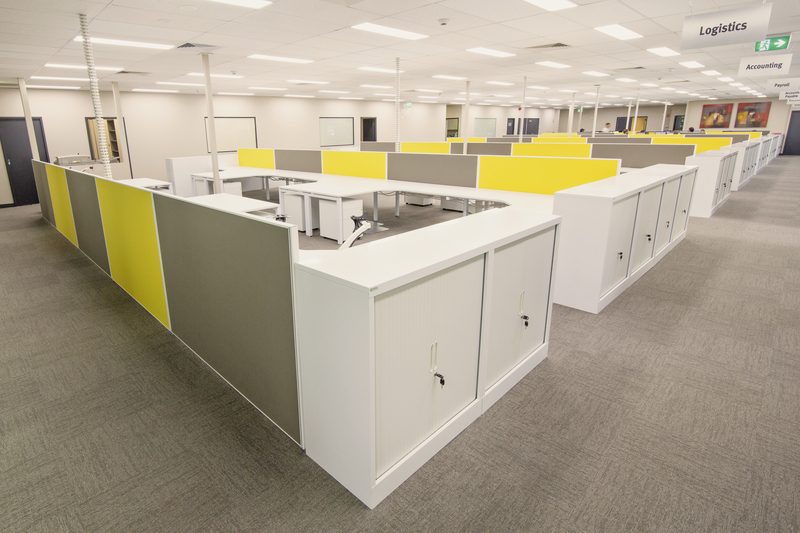 Using Australia’s outback and Ausdrill’s corporate colours, furniture has been selected and finished with the infamous yellow and green colour palette, and finished with feature pendants illuminating a custom bench and vinyl plank floor. Ausdrill’s branding was a driving force behind the final touches applied to the refurbishment. The entire office delivers subtle pops of colour complemented by a darker carpet tile and frosted film across all meeting and boardroom glazed walls. 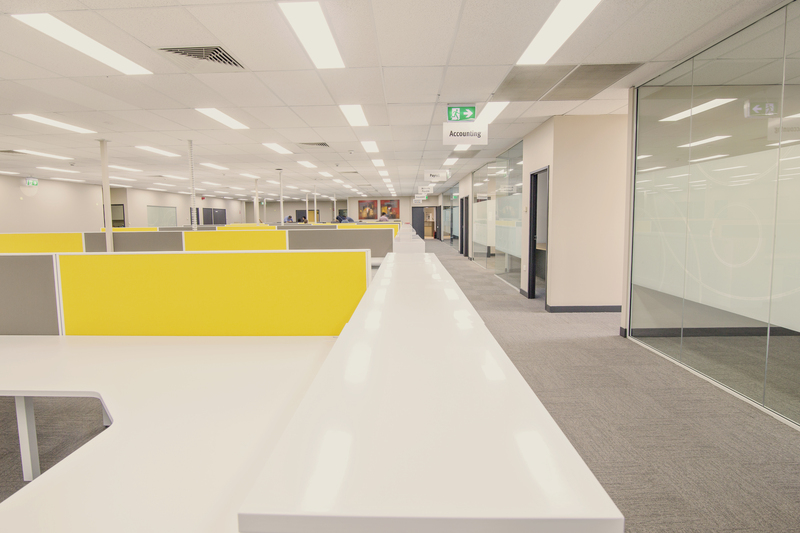 The refurbished space perfectly captures Ausdrill’s rich history and cements their position as a market leader in the Australian resources industry.